The Study of Photosynthesis — It’s All Greek to Us! Another fabulous week of orthographic discoveries! On my last orthography post I reported that most of the students were thinking that <photo> is the prefix in the word <photosynthesis>. 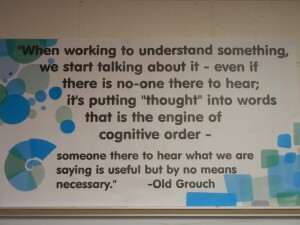 Then our friend Old Grouch left a comment that gave us much to think about, and led to wonderful discoveries! The specific comment that he began with was, “I know that spellings which have the digraph ‘ph’ to represent /f/ are signalling a near certain Greek connection.” Right away the students named other words in which the digraph<ph> represented /f/: photosynthesis, phloem, cell phone, photograph, photographer, and elephant. So now we know that these and others like them may well have a Greek connection. Another signal for a Greek connection that I was aware of was the digraph <ch> and how it sometimes represents /k/. The students began to name words like chorus, choir, synchronize (this was still on the board since we were discussing the prefix <syn> earlier), and chemical. Bing! Light bulbs were going off in heads all over the room! Words were thrown out like photosynthesis, chloroplast, chlorophyll, and phloem. From these rich discussions we went back to Old Grouch’s next comment, “Add to that the fact that the connecting vowel letter ‘-o-‘ is also a strong signal of Greek origin, and I was beginning to get the feeling that ‘photo’ is not only complex (that means it contains more than one element), but also that one of its elements could well actually be a base.” Hmmmm. What would that mean if the word had two bases? So Old Grouch, approaching this idea with a scientific mindset, searched for words that had the <phot> morpheme but were not followed by an <o>. He found one! He found the word <photic>! He even found the word used to describe a sneeze. He found that a photic sneeze is when someone sneezes because of a bright light. So here is the evidence that the <o> in <photo> is a connecting vowel and not part of the base which is <phote>. If you are wondering why there is an <e> on this base, please read the comment on this post. Old Grouch has enlightened us again. Such interesting things to ponder! At this point we went back to our word sum and rewrote it to say, <phote>+<o>+<syn>+<thesis> –> <photosynthesis>. My final question? How does knowing what these morphemes mean help us have a better understanding of <photosynthesis>? After a brief moment of thinking, one of the students offered this, ” Well, the water and carbon dioxide are being put <thesis> together <syn>, and that can’t happen without light energy <photo>. How’s that for brilliant? Even if we had done nothing else today, because of these 45 minutes, our day was well spent! So what did they head into the weekend with? The desire to discover the true meaning of <hypothesis> and how its base is related in meaning to <photosynthesis>. Light Energy, Water, Carbon Dioxide … and Action! I have been teaching 5th graders about photosynthesis for a long time. When I first began, I taught from the science text book. When the students weren’t very successful understanding the process, I began to offer an oral test at my desk using a diagram. More were successful with this method, but they still stressed about it and I felt like I was pulling the answers out of them rather than the students feeling comfortable with what they knew. I still wasn’t satisfied with their level of understanding. Then I wrote a script and a rap (to open the show). The very next year I added some fact cards to be read at the end of the play to lend understanding to the true importance of photosynthesis to human beings. Recently I added a section between the rap and the play which kind of explains to the audience how tiny a place a chloroplast is and how many there are in each cell and how all the chloroplasts in all the cells are housing the miracle of photosynthesis all the time. The other clever thing I’ve done is to have three different casts. Instead of six students (speaking parts and a director) memorizing the process of photosynthesis, there are now 18! And the rest participate in watching the show in rehearsals and performances (of which there are 12 – each cast performs 4 times). The students are very excited about performing so many times … until we are at the 9th and 10th show and they are getting a bit bored with it. That’s when we talk about digging deeper. Each audience deserves the best show a cast can give. We refer back to this moment often during the year because having to dig deeper happens lots in life. 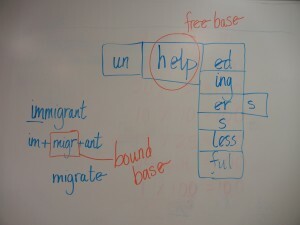 Bound Bases and Assimilated Prefixes – Good Stuff! I am always delighted when Old Grouch checks in on our studies and then takes our understandings to the next level. (Please read his comment on our last post.) I suspected that <gn> was a bound base in the word <cognition>, but didn’t feel as if I had enough evidence to draw that conclusion. Old Grouch compared the word <cognition> to the very old word <agnize> and was able to identify the <a> as an assimilated form of the prefix <ad>. After my students and I watched Dan Allen’s students learn about the assimilated prefix <im> earlier today, this discovery was timed perfectly to reinforce an idea new to us. Well, if <a> is the prefix, and <ize> is an attested suffix (used in such words as colonize, itemize, energize, and sanitize), that leaves <gn> to be the bound base element. It is a bound base element because it can’t exist as a word on its own. It needs an affix (suffix or prefix) to be labeled as a word. With the understanding that <gn> is the base, I walked the class through making a word matrix. The columns to the left of the base <gn> are prefixes. The columns to the right of the base are suffixes. Looking at this matrix I could write the word sum <re> + <co> + <gn> + <ize/> + <able> –> recognizable. Did you follow that? Can you see other words to build? Thank you Old Grouch! Thank you Mr. Allen and students! Words Incognito? Maybe We Need to Learn to Look Closer…. There is so much to introduce at the beginning of each school year. It’s like walking through a brambly woods. The brambles are a tangled mess of new vocabulary, new procedures, and a system for organizing writing, science, orthography, reading, and math. As the students begin to get a handle on routines and the terminology that will become the foundation in each subject area, the brambles begin to shrink and whither away. It is then that we breathe a collective sigh. It is then that the big in-depth discoveries happen as we step into the frontier that lies ahead. Late last week I wanted to model how we would conduct a full fledged word investigation. We chose the word <cognitive> because it is used in a quote that is posted in the front of our room. Looking at the above list, students made hypotheses regarding the word sum for <cognitive>. Next we looked for its origin at Etymonline and found that <cognitive> is from the 1580s, from Latin <cognit->, past participle stem of <cognoscere> + <ive>. 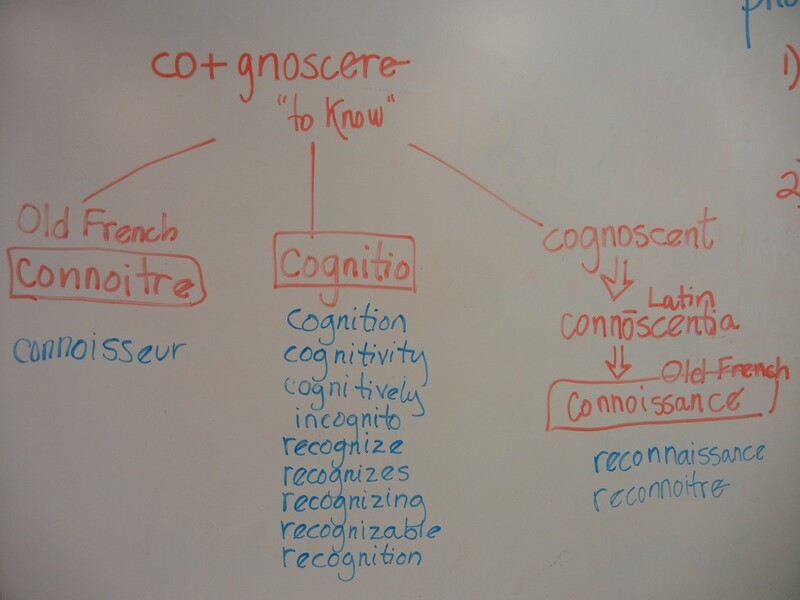 We followed a link to <cognizance> and we found that it’s from mid-14C, from Anglo-French conysance “recognition”, later, “knowledge”, from Old French conoissance “acquaintance, recognition; knowledge, wisdom” (Modern French connaissance), from past participle of conoistre “to know” from Latin cognoscere “to get to know, recognize”, from com- “together” <co-> + <gnoscere> “to know”. The <g> was restored in English spelling 15c. and has gradually affected the pronunciation, which was always “con-“. The old pronunciation lingered longest in legal use. 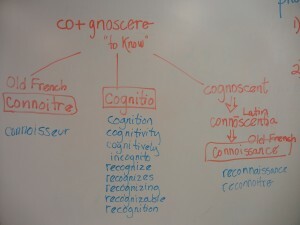 So at Etymonline we found that <cognitive> comes from the Latin <cognit->, and <cognizance> comes from Latin <cognoscere>. We see evidence here that <co> may be a prefix in the latter, but not any clear evidence that <co> is a prefix in <cognitive>. Interesting, but we definitely need to gather more information. The next resource I checked with was the Collins Gage Canadian Dictionary. The entry for <cognition> states that it comes from Latin cognitio from cognoscere; <co> + <gnoscere>. 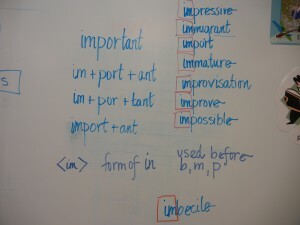 Today we talked about how the spelling of one word can be altered over time. It was interesting to read that the <g> had been dropped, but then later made a reappearance. I made the columns on the board and as we decided where each of the words they had found belonged, we talked about the meaning of each. It was so interesting to listen to them tie each word back to the meaning of cognoscere. It was a lively discussion. Lots of eyebrows went up and smiles grew when I mentioned that I would love to be a connoisseur of fine chocolate. Ultimately though, the favorite word of the day was reconnoitre. Feeling it leave your mouth, it just doesn’t sound like a serious military word. Only three days into the new school year and it already feels like we’re a family of sorts. There’re those genuine smiles that are given and received. There’s that willingness to learn new things in new ways. There’s that surprise when looking at the clock and realizing that the day is almost over. There’s that promise of great learning and experiences to come. And there’s that grin of satisfaction at the end of the day, coupled with the comforting thought that tomorrow will equal or better the experiences of today. Yes, it feels like we are back together again when in reality we have only just met. What a sign of great comraderie and discovery to come! After great experiences with my 5th graders last spring and an absolutely fabulous training in Canada this summer, I was very excited to introduce orthography to my new students. I had carefully prepared a lesson using our Smartboard. I also had a great video lined up -one of Dan Allen’s students Skyping with Old Grouch just two weeks ago. But then, computer problems forced me to change my plans. For a moment my head was spinning … where to start? I decided to begin by simply asking the students for a word they have sometimes misspelled. Our next step was to prove whether or not <ant> was a suffix. We tried to think of other words with an <ant> suffix, but weren’t having much luck. We decided to shift gears and look at whether or not we could prove that <im> was a prefix. We had much better luck with that. Our list included improve, impressive, immature, immigrant (the minute this word was suggested, someone noticed that it had an <ant> which might possibly be a suffix), import, impeccable, and imbecile. At this point we talked about the list we had. Someone recognized that <immature> could be <im> + <mature>, <immigrant> could be <im> + <migrant> and <import> could be <im> + <port>. Ezra grabbed a dictionary and looked up <im>. It was identified as a prefix that is used in the same way as the prefix <in>. The dictionary also mentioned that when the prefix <im> is used, it is followed by a morpheme that begins with either a <p>, <m>, or <b>. When we looked back at our list, that piece of information fit every one of our words. What a cool discovery! Since someone has suggested that <immigrant> might have an <ant> suffix, I created a word sum for it. I wrote <im> + <migr> + <ant> on the board. 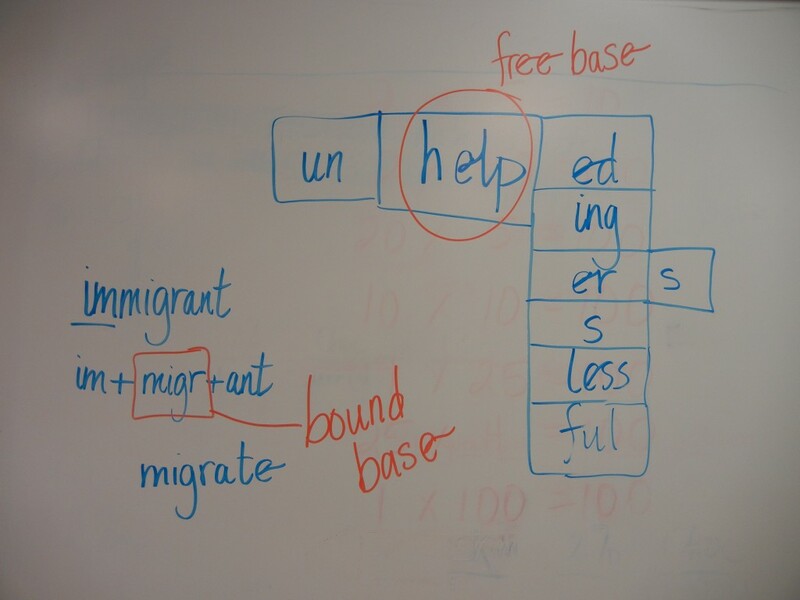 Using this word sum as an example, I was able to talk about bound bases (a base which needs an affix to exist as a word). We contrasted that information with the word sum for <import> which is <im> + <port>. In this situation <port> is a free base (meaning that it can exist as a word without any affixes). All in all many principles were introduced which will be questioned and researched and proven throughout the year. It is all very exciting indeed!